Don't Eat the Paste: Craving White Castle Sliders? This is a Sponsored post written by me on behalf of White Castle for SocialSpark. All opinions are 100% mine. I haven't been to White Castle in nearly 20 years. If they ever opened a location here in Anchorage, it would be wonderful. I can picture it now, it would be one of the places people would make a point of visiting when they were in the big city. It's about 3000 miles from here to the closest White Castle and we would have to cross Canada driving down the Alcan Highway. That's a bit far for a road trip unfortunately. We do plan to go to White Castle when we go to Minnesota on vacation. I'd be willing to drive 6 hours to get to White Castle if one ever opens in Fairbanks or someplace else in Alaska! You can sign up using your favorite social network, and you get a coupon link when you verify your email. 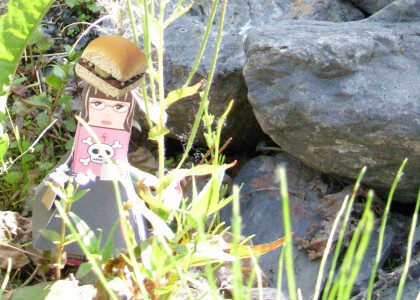 They also have great challenges for Cravers who live in the contiguous 48 states. Road Trips, You Just Got Served, National Anthem and you can see the previous challenges. Entering is easy and you can ask your friends to join and vote for your entry to win fantastic, fun prizes. In you just got served, you give a loved one or friend an empty Slider box and get a picture of them when they open it to find there are no yummy sliders in it! In this fun one, you edit in a slider into a vacation photo of a historical place. 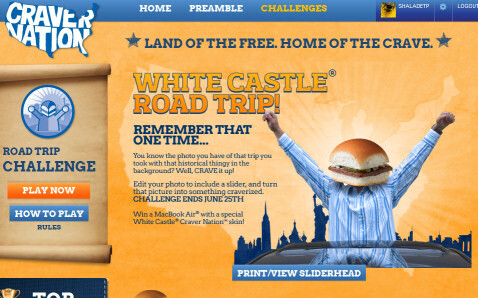 The grand prize is MacBook Air with a White Castle CraverNation skin. 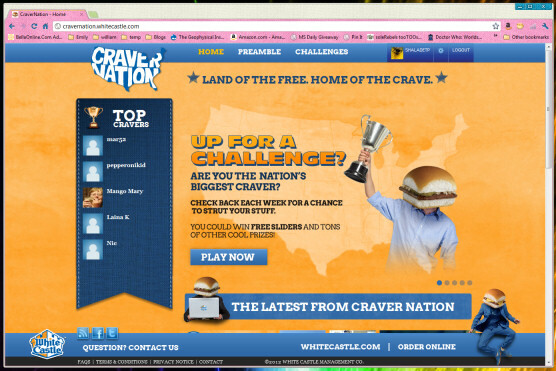 You can encourage your friends to join CraverNation, get free sliders, and vote for your design. Ends June 25th. Hey, those are historic rocks! That was a gold claim back in the day. People still pan for gold there. The other current challenge is to write and record a CraverNation National Anthem. You can make your own video, or watch and vote on the videos posted. Ends on June 27, 2012.